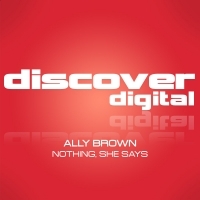 Ally Brown returns to Discover this time showing a more melodic side that see's him move from Discover's Dark sub-label over to the Red brand. Ally's previous releases on the label have topped the charts on several of the white-label stores and this looks set to follow suit. A strong remix package backs up the original, with mixes from Chris Porter and Alan Ruddick. 'Nothing, She Says' is available now from Beatport and iTunes.